Contains both flags marking a request's current state, and flags requesting some processing to be done at a later stage. TODO: better distinguish the two cases. Definition at line 20 of file RequestFlags.h. clone the flags, resetting to default those which are not safe in a related (e.g. ICAP-adapted) request. Definition at line 18 of file RequestFlags.cc. Definition at line 119 of file RequestFlags.h. Definition at line 124 of file RequestFlags.h. Referenced by clientReplyContext::cacheHit(), clientReplyContext::identifyFoundObject(), and refreshCheck(). Definition at line 58 of file RequestFlags.h. Referenced by AuthenticateAcl(), clientReplyContext::buildReplyHeader(), clientBeginRequest(), clientProcessRequest(), HttpStateData::continueAfterParsingHeader(), HttpStateData::httpBuildRequestHeader(), and HttpStateData::processSurrogateControl(). Definition at line 28 of file RequestFlags.h. Referenced by clientCheckPinning(), clientHierarchical(), clientInterpretRequestHeaders(), copyOneHeaderFromClientsideRequestToUpstreamRequest(), HttpStateData::reusableReply(), and FwdState::usePinned(). Definition at line 30 of file RequestFlags.h. Referenced by httpFixupAuthentication(), HttpRequest::prepForDirect(), and HttpRequest::prepForPeering(). Definition at line 85 of file RequestFlags.h. Referenced by HttpStateData::buildRequestPrefix(), HttpStateData::processReplyBody(), and HttpStateData::reusableReply(). Definition at line 32 of file RequestFlags.h. Referenced by CheckQuickAbortIsReasonable(), clientInterpretRequestHeaders(), copyOneHeaderFromClientsideRequestToUpstreamRequest(), testRock::createEntry(), clientReplyContext::createStoreEntry(), HttpStateData::decideIfWeDoRanges(), ClientHttpRequest::doCallouts(), HttpStateData::httpBuildRequestHeader(), httpMaybeRemovePublic(), Ftp::Server::parseOneRequest(), peerDigestRequest(), Ftp::Server::setReply(), storeCreateEntry(), storeDigestRewriteStart(), and testUfs::testUfsSearch(). Definition at line 90 of file RequestFlags.h. Referenced by clientReplyContext::buildReplyHeader(), clientReplyContext::checkTransferDone(), Http::One::Server::handleReply(), Http::Stream::sendBody(), and Http::Stream::sendStartOfMessage(). Definition at line 76 of file RequestFlags.h. Referenced by clientReplyContext::buildReplyHeader(), HttpStateData::buildRequestPrefix(), clientCheckPinning(), HttpStateData::decideIfWeDoRanges(), ConnStateData::pinConnection(), and HttpStateData::processReplyBody(). Definition at line 78 of file RequestFlags.h. Referenced by clientReplyContext::buildReplyHeader(), clientCheckPinning(), and HttpStateData::processReplyHeader(). Definition at line 81 of file RequestFlags.h. Definition at line 104 of file RequestFlags.h. Referenced by DestinationIPLookup::checkForAsync(), ACLDestinationASNStrategy::match(), and ACLDestinationIP::match(). Definition at line 99 of file RequestFlags.h. Definition at line 48 of file RequestFlags.h. Referenced by clientReplyContext::handleIMSReply(), and refreshCheck(). Definition at line 111 of file RequestFlags.h. Referenced by TunnelStateData::clientExpectsConnectResponse(), ConnStateData::initiateTunneledRequest(), and ClientHttpRequest::processRequest(). Definition at line 103 of file RequestFlags.h. Referenced by FwdState::dispatch(), Ftp::Server::parseOneRequest(), and FwdState::start(). Definition at line 34 of file RequestFlags.h. Referenced by clientInterpretRequestHeaders(), neighborsDigestSelect(), peerSelectIcpPing(), peerWouldBePinged(), and storeCreateEntry(). Definition at line 64 of file RequestFlags.h. Referenced by clientHierarchical(), HttpRequest::maybeCacheable(), PeerSelector::resolveSelected(), and FwdState::start(). Definition at line 60 of file RequestFlags.h. Referenced by clientInterpretRequestHeaders(), HttpRequest::manager(), HttpRequest::maybeCacheable(), and refreshCheck(). Definition at line 26 of file RequestFlags.h. Referenced by clientHierarchical(), clientInterpretRequestHeaders(), HttpRequest::conditional(), clientReplyContext::handleIMSReply(), clientReplyContext::processConditional(), refreshCheck(), and clientReplyContext::sendNotModified(). Definition at line 62 of file RequestFlags.h. Referenced by AuthenticateAcl(), clientReplyContext::buildReplyHeader(), TunnelStateData::clientExpectsConnectResponse(), clientHierarchical(), FindListeningPortAddress(), HttpRequest::manager(), ACLDestinationIP::match(), HttpRequest::maybeCacheable(), PeerSelector::resolveSelected(), ClientHttpRequest::sslBumpStart(), and FwdState::start(). Definition at line 66 of file RequestFlags.h. Referenced by AuthenticateAcl(), TunnelStateData::clientExpectsConnectResponse(), clientHierarchical(), FindListeningPortAddress(), HttpRequest::manager(), ACLDestinationIP::match(), HttpRequest::maybeCacheable(), PeerSelector::resolveSelected(), ClientHttpRequest::sslBumpStart(), and FwdState::start(). Definition at line 72 of file RequestFlags.h. Referenced by clientProcessRequest(), clientReplyContext::identifyStoreObject(), and FwdState::Start(). Definition at line 108 of file RequestFlags.h. Referenced by clientInterpretRequestHeaders(), StoreEntry::hasIfNoneMatchEtag(), and HttpStateData::httpBuildRequestHeader(). Definition at line 36 of file RequestFlags.h. Referenced by clientHierarchical(), clientInterpretRequestHeaders(), netdbExchangeStart(), peerAllowedToUse(), and clientReplyContext::processMiss(). Definition at line 74 of file RequestFlags.h. Referenced by clientReplyContext::buildReplyHeader(), and HttpStateData::sendRequest(). the requested object needs to be validated. See client_side_reply.cc for further information. Definition at line 46 of file RequestFlags.h. Referenced by clientReplyContext::buildReplyHeader(), clientReplyContext::cacheHit(), clientReplyContext::createStoreEntry(), FwdState::makeConnectingError(), ErrorState::NewForwarding(), and peerAllowedToUse(). Definition at line 24 of file RequestFlags.h. Referenced by clientReplyContext::cacheHit(), clientInterpretRequestHeaders(), clientReplyContext::identifyFoundObject(), clientReplyContext::identifyStoreObject(), Ftp::Server::parseOneRequest(), peerAllowedToUse(), refreshCheck(), and Ftp::Server::setReply(). always use noCacheHack() for reading. Definition at line 56 of file RequestFlags.h. Referenced by clientInterpretRequestHeaders(), and noCacheHack(). Definition at line 88 of file RequestFlags.h. Definition at line 83 of file RequestFlags.h. Referenced by HttpStateData::buildRequestPrefix(), FwdState::checkRetry(), FwdState::connectDone(), FwdState::connectStart(), HttpStateData::peerSupportsConnectionPinning(), FwdState::pinnedCanRetry(), HttpStateData::processReplyBody(), FwdState::reforward(), FwdState::secureConnectionToPeerIfNeeded(), HttpStateData::sendRequest(), FwdState::start(), and FwdState::usePinned(). Definition at line 38 of file RequestFlags.h. Referenced by clientReplyContext::buildReplyHeader(), clientSetKeepaliveFlag(), ConnStateData::quitAfterError(), clientReplyContext::replyStatus(), clientReplyContext::setReplyToError(), and Http::Stream::writeComplete(). Definition at line 42 of file RequestFlags.h. Referenced by ClientRequestContext::clientRedirectDone(), copyOneHeaderFromClientsideRequestToUpstreamRequest(), Ssl::PeekingPeerConnector::initialize(), PeerSelector::resolveSelected(), and FwdState::start(). Definition at line 40 of file RequestFlags.h. Referenced by Store::Controller::allowCollapsing(), peerAllowedToUse(), peerDigestRequest(), and clientReplyContext::processExpired(). Definition at line 106 of file RequestFlags.h. Referenced by clientProcessRequestFinished(), and errorAppendEntry(). The client IP address should be spoofed when connecting to the web server. This applies to TPROXY traffic that has not had spoofing disabled through the spoof_client_ip squid.conf ACL. Definition at line 70 of file RequestFlags.h. Referenced by getOutgoingAddress(), HttpRequest::manager(), and HttpStateData::processReplyBody(). Definition at line 101 of file RequestFlags.h. 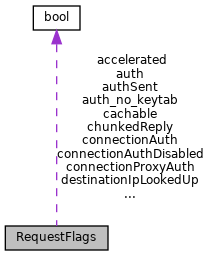 Referenced by AuthenticateAcl(), clientReplyContext::buildReplyHeader(), clientProcessRequest(), FwdState::connectDone(), FwdState::connectStart(), HttpStateData::HttpStateData(), ACLProxyAuth::matchProxyAuth(), FwdState::pinnedCanRetry(), FwdState::secureConnectionToPeerIfNeeded(), and HttpStateData::sendRequest(). Definition at line 94 of file RequestFlags.h. Referenced by FwdState::completed(), FwdState::connectDone(), FwdState::dispatch(), Ssl::PeekingPeerConnector::initialize(), Ssl::PeekingPeerConnector::noteNegotiationDone(), and FwdState::secureConnectionToPeerIfNeeded(). Definition at line 50 of file RequestFlags.h. Referenced by clientReplyContext::buildReplyHeader(), clientReplyContext::handleIMSReply(), and refreshCheckHTTP(). Definition at line 92 of file RequestFlags.h. Referenced by Http::One::Server::handleReply(), and clientReplyContext::sendStreamError().